Cyrsti's Condo: Don't You JUST Hate This? Your commute is destroyed by...a pissed off rampaging drag queen? Just imagine what your local traffic reporter would say? Don't go that way! Stay back and you don't have to tip the queen to get through! 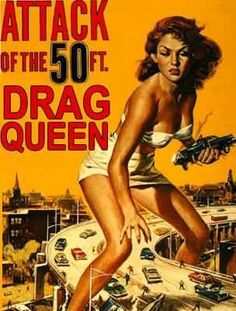 I'm fairly sure I've seen a few drag queens who looked like they were close to that tall in their heels! I saw a queen do a back flip in heels one night and about swallowed my beer bottle!